The Canadian Opera Company has just premiered an intriguing new double-bill of one-act operas. One is Puccini’s only comic opera Gianni Schicchi (1919). The other is A Florentine Tragedy (Eine florentinische Tragödie) from 1918 by Alexander Zemlinsky. From a historical viewpoint, since both operas are set in Florence and were written at the same time, they provide a look into the tensions and musical styles of the period. From a dramatic viewpoint they provide a contrast of tragedy and comedy although both based on a similar theme. From a musical viewpoint they provide a musical feast made richer through contrast than would be true with an all-Puccini or all-Zemlinsky evening. With Sir Andrew Davis at the podium, they make an excellent showcase for the superb music-making of the COC Orchestra. Gianni Schicchi is the third part of his collection of three one-acters called Il Trittico. The COC has staged Schicchi only once before in 1996 paired with Leoncavallo’s Pagliacci. This is the first time any opera by Zemlinsky has had a full professional staging in Canada. Zemlinsky (1871-1942) was one of the many composers whose works were suppressed when the Nazis came to power and who has only regained recognition in the past two decades. In Europe A Florentine Tragedy is usually paired with another of his one-act operas, also based on Oscar Wilde, Der Zwerg (The Dwarf) from 1922. While it would be good to see Schicchi as part of Il Trittico as Puccini intended and while presenting two Zemlinsky operas based on Wilde would seem to be more logical, the pairing of A Florentine Tragedy with Gianni Schicchi proves to be both emotionally and intellectually stimulating. The stories of the two have more in common than one might think. In Tragedy, the merchant Simone (Alan Held) returns home to find his wife Bianca (Gun-Brit Barkmin) romantically entwined with Guido Bardi (Michael König), the Prince of Florence. What ensues is a suspenseful cat-and-mouse game between Simone and the lovers. He plays the host and pretends that nothing is out of the ordinary but the metaphors he uses suggest just the opposite. While Simone has the advantage of host over guest, Guido has the advantage of prince over liege, with Bianca using her liaison with the Prince as a means of flouting Simone’s power over her. Zemlinsky’s music, which will remind music lovers of Mahler and Richard Strauss, is the perfect medium for this kind of situation with its constantly shifting tonal centres mirroring the constantly shifting ground in the power struggle among the three characters. Ultimately, Simone’s battle of wit and implication gives way to a physical struggle and a surprise twist at the end. In Gianni Schicchi, the Donati family discovers to their chagrin that their rich relative Buoso has left all his money and land to the monks. Since no one outside Buoso’s house knows yet of his demise, the Donatis seek the help of the wily Gianni Schicchi (Alan Held). Schicchi’s daughter Lauretta (Simone Osborne) wants to marry Rinuccio (René Barbera), nephew of the imperious Zita (Barbara Dever), but she refuses because Lauretta has no dowry. Yet, persuaded by Lauretta, Schicchi agrees to help. The Donatis will call a notary (Philippe Sly) and Schicchi, impersonating Buoso, will dictate a new will to cancel Buoso’s real will. Here, too, there is a twist at the end. Both stories are linked not just because they both are set in Florence but because both focus on a central character--Simone in Zemlinsky or Schicchi in Puccini--who slyly manipulates the action to his own benefit. Both operas are about struggles over ownership, whether its be Bianca in Zemlinsky or the estate of Buoso in Puccini. And both operas offer depictions of the Darwinian survival of the fittest. In Zemlinsky this disturbingly comes down to pure brute force. In Puccini this hilariously comes down to wit. Simone asks in the Zemlinsky if this room is the world, and the same could be said in the Puccini, where the world on stage is a microcosm for the world in general. What is so fascinating is that the conclusion of Tragedy makes us feel so ill at ease while the parallel conclusion in Schicchi makes us cheer. Diva-turned-director Catherine Malfitano has further linked the two stories by setting them in the same decaying Florentine villa, beautifully designed by Wilson Chin. While the original stories are set in the 16th century (Zemlinsky) and the 14th (Puccini), Malfitano has updated the Zemlinsky to the 1920s and the Puccini to the present so that we move forward in time through the evening. Costume designer Terese Wadden has created exquisite period gowns for Bianca in the Zemlinsky that fully live up to their opulent description in the libretto. In Schicchi she has emphasized the most groan-worthy elements of modern fashion. In both operas Malfitano draws highly detailed acting that is alive to the nuances found in both the words and the music. She creates a sense of mounting menace in Tragedy as if it were a play by Albee or Pinter. In Schicchi she adds numerous comic touches, such as having Buoso die on his sofa-bed at the beginning while the men cheer a soccer goal on television, that make this the funniest Gianni Schicchi I’ve ever seen. She undercuts the saccharine quality of Lauretta’s famous aria “O mio babbino caro” by making clear that Lauretta is consciously using the song to win over Schicchi. When she sees he’s given in to her, she gives Rinuccio a secret thumbs-up. The double-bill provides a superb spotlight for the talent of bass-baritone Alan Held. He creates a chilling portrait of a man vainly trying to keep his rage in check in Tragedy and a wonderfully warm portrait of a scoundrel with a soft spot for his daughter in Schicchi. It’s a deep pleasure to experience singing and acting of such range and sensitivity all in a single evening. Gun-Brit Barkmin has a Wagnerian soprano and sports a defiant attitude in Tragedy that matches the ambiguity suggested by her Louise Brooks hairdo. She’s a seductress but one who also puts her own survival first. Barkmin has a the minor role of Nella in Schicchi and shows she’s equally adept at comedy. Michael König, who appears only in Tragedy, has a voice ideal for a Wagnerian tenor except that he lacks the power to project it fully. He alone is not always able to cut through Zemlinsky’s masses of sound. In Schicchi, Simone Osborne and René Barbera are clear standouts as the young lovers. Unlike some directors, Malfitano gives equal weight to Rinuccio’s aria in praise of Schicchi (“Firenze è come un albero fiorito”) as she does to Lauretta’s famous aria, which, for once, helps place the two on an equal footing. Both delivered their set pieces beautifully and were rewarded with sustained applause. Among the comic relatives, Barbara Dever and Donato Di Stefano are both strong of voice and perceptive in characterization, with Dever’s Zita reminding you of any number of bossy senior matrons you may have encountered. Sir Andrew Davis, Principal Conductor of the Toronto Symphony Orchestra from 1975 to 1988, received bravos before he even picked up the baton. He gives such a persuasive account of the Zemlinsky, so alive to its ebb and flow and its doom-laden forward momentum, that he convinces you that the work is a masterpiece. Written for an orchestra of over 80 musicians, Davis keeps the multiple layers of Zemlinsky’s scoring absolutely clear and uses the constantly shifting tonal centres to build up an inexorable tension. He deals equally well with Puccini’s lighter textures and allusions to other works. Puccini’s turning of Zita, Nella and La Ciesca (Rihab Chaieb) into middle-class Rhinemaidens trying to seduce Schicchi-as-Alberich is particularly amusing. In sum, the COC’s new double-bill is a great success and makes us looks forward to more such pairings in future, including, let’s hope, more of Zemlinsky and others of his generation whose music, once suppressed, is only now returning to its rightful place in the repertory. Note: Another version of this review will appear later this year in Opera News. 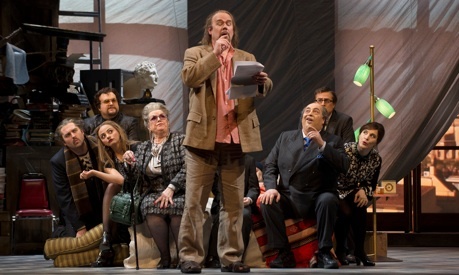 Photo: (top) Gun-Brit Barkmin, Michael König and Alan Held in background in A Florentine Tragedy; (middle) Alan Held (centre) and cast of Gianni Schicchi. ©2012 Michael Cooper.